The flashpoints of conflict in Asia include the dictatorial rule in Burma, the former trouble in Aceh in Indonesia, the Moro conflict Mindanao, and the insurgency in Southern Thailand. Ramos-Horta said Timor Leste has tapped the network of non-government organizations, including the Catholic Church, in its rebuilding, although he admitted relying on foreign assistance for major parts of its rebuilding. 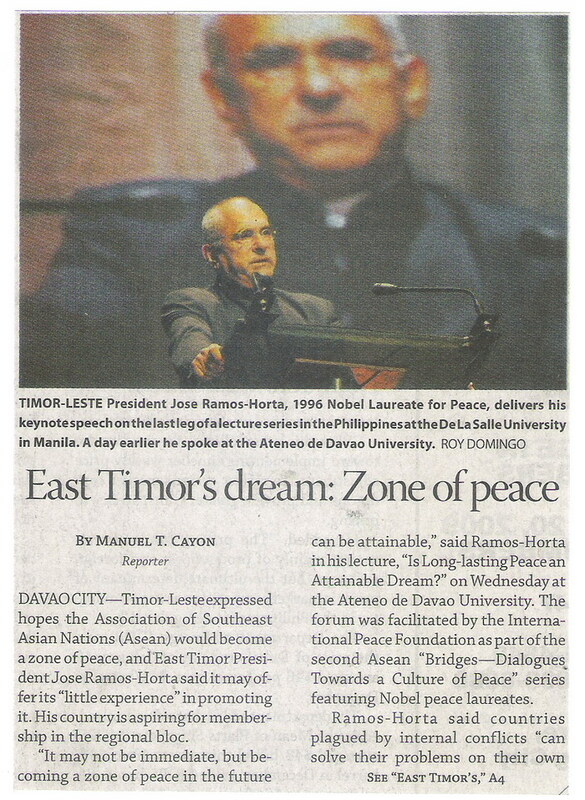 “I told donors, what do they have for East Timor in 2000, in 2001? I appealed to them to help us in the post-conflict situation, he said. “Remember one thing: Peace has to be paid, it has to be bought, maybe not in the sense or understanding that we have about aid, about cash that you are referring” but in the cost of structures, organizations, etc. “But [Timorese] who can, those who have resources, should be patient, and invest. I don’t think the [foreign nations development] aid will address the root cause of the conflict, the root causes of poverty,” he said.